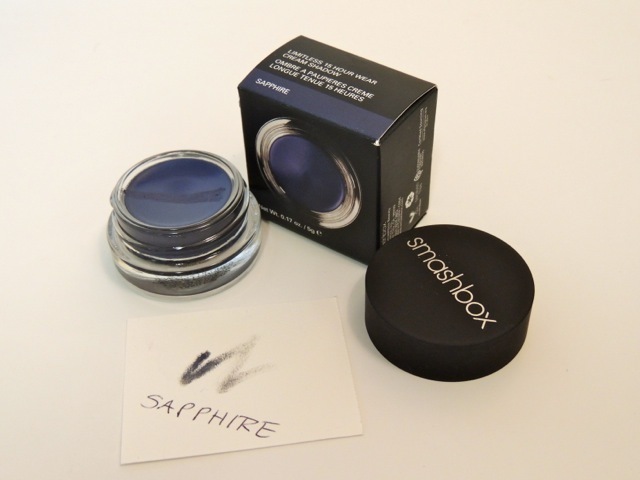 SMASHBOX Limitless 15 Hour Wear Cream Shadow - Sapphire - Give Me Gorgeous! The glass pot that holds this product has a screw-on plastic top and the weight of the glass gives it a nice feel. The color Sapphire is a deep navy with a bit of a purple shimmer. Its created to last through 15 hours of wear and is both sweat and humidity resistant. I use this color mostly as an eyeliner for the upper and lower lids. It has a creamy texture and goes on smoothly. Truly stays on all day!